We put in another call to Brett Favre's agent, Bus Cook, this morning. Upon hearing that I was calling from Deadspin, he let out a long sigh, but was gracious enough to stay on the phone. 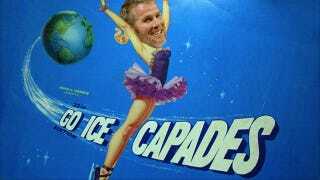 In an effort to expand on ESPN's report from Monday—in which ESPN established via anonymous source that Brett Favre would "listen" to the Bears if they called him—I asked ol' Bus if Brett would also take a phone call from the Ice Capades. Cook either stopped listening to me the moment he heard Deadspin, or he is holding out hope the Ice Capades show more interest than the Bears did. "I don't want to go into hypotheticals," he said. He went on for a bit, telling us he didn't know anything about the reports out of Chicago, then he wished us a nice day and hung up the phone. We'll have more on this as events warrant.